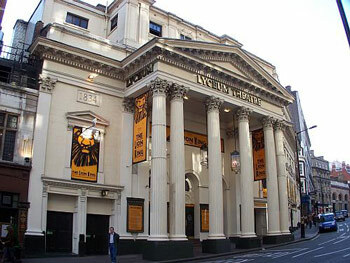 The Lyceum Theatre on Wellington Street near London’s Covent Garden has a very long and distinguished history. The first Lyceum Theatre was built in 1794 on a site adjoining the present one with its main entrance on the Strand (long before Wellington Street was built). The original architect for the Wellington Street Lyceum was Samuel Beazley but in 1882 the famous theatre architect C.]. Phipps partially reconstructed the building and made many improvements. In 1904 Bertie Crewe who was another well respected theatre architect rebuilt the Lyceum retaining only Samuel Beazley's original facade and portico. In 1937 the theatre was converted into a cinema which involved a great deal of reconstruction including building a projection booth above the portico which is still there today. The Cinema opened with the “The Gang Show” but the owner did not realise that the Film Circuits of the time had the distribution rights sewn up and it was converted back to a theatre after a month. In July 1939 the Theatre closed down after the final performance of John Gielgud's production of “Hamlet” and was scheduled for demolition to make way for a block of flats, but it was stopped in the nick of time when a new scheme to widen the Strand meant that a roundabout would be built on the site instead. But due to the outbreak of the World War II the demolition of the Lyceum Theatre was put on hold and it remained empty throughout the war years. In 1945 the theatre was converted into the Palais de Dance for Mecca and it was very popular and successful for a number of years, but after its closure the Lyceum remained dark again for a number of years. After the abolition of the GLC in 1986 the 125-year lease of the building was sold to Brent Walker and its future looked even more uncertain. But the freehold was later transferred to The Theatres Trust and they negotiated a transfer of the lease from Brent Walker to the Apollo leisure group, who obtained Lottery funding and restored the auditorium and converted the building back into a theatre in 1996. The Lyceum Theatre now has a seating capacity of 2,000 and is Listed Grade II. It was purchased by The Ambassador Theatre Group in November 2009. Infra-red loop system for the hard of hearing. Headsets are available for a returnable deposit of £20, please contact a member of staff upon arrival. Reception best in Royal Circle and Stalls. Induction loop at Box Office. Two adapted toilets by the entrance to the Stalls.